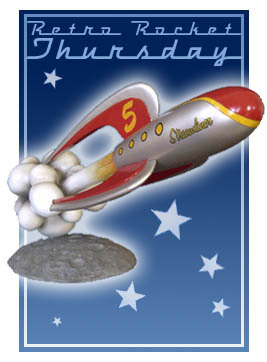 Thursdays are Retro Rocket Days here at Webomator. Okay, who am I kidding? Every day is retro rocket day around here. But on Thursdays, it’s official. Today’s blast from the past is actually called the Blast Rocket . It’s one of Jeff Brewer’s amazing rocket statues in cast resin, with a weighted base and just about the perfect puffy cloud of exhaust. 7.5″ tall and 11″ long, it’s meant to sit on your desk and show everyone that you’re headed off to the asteroid belt right after work. In style. It’s still early in the year, unless we’re really planning ahead – but for the first time I’ve added calendars to my Celtic Art & Retro-Futuristic Design site.There’s a Celtic Art Calendar with twelve of my original knotwork designs. They’re what you might call eclectic, including a knotwork biohazard symbol, a Chaos Star design, a Skull and Crossbones and a few more traditional designs like my “Tanglewood” and “An Claidheam Soluis” pictures. On the Retro-Futuristic side, my 2008 Retropolis Calendar offers twelve months of retro rockets, faithful robots, flying cars, and death rays. Sort of an early indicator of the year we have to look forward to. Hint: be prepared to duck. And on a tangential note, my Retrovert site also has a couple of WPA poster calendars (Travel Posters and Health & Safety Posters) and one with covers from vintage Modern Mechanix & Inventions magazines. “Pest Control” is an animated music video by Peter Leary and a crew of co-conspirators, using Me the Conqueror’s Lo Fi as the setting for an insect rock concert that leads to, well, insurrection. Or something like it. Really nicely executed in every way. While it’s not new (2005), it does seem to be new to the web. Therefore, go watch it. Shades of the future that never was! A restaurant in Nuremberg has done away with waiters (in a completely humane way) by replacing them with a gravity-feed system and networked computers at every table. The kitchen’s above the dining room. 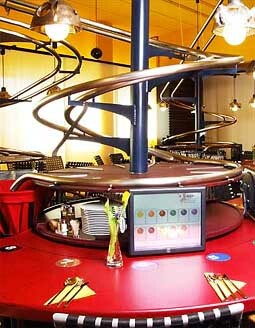 Customers order using touch-screen computers at their tables, and when their food’s ready it slides down gently on spiral rails. I suppose that to complete the circuit you’d want more rails leading to dishwashers in the basement, but for now it looks like the jobs of buspersons are secure. More here. This is somehow like the automated parking garage that was designed in Germany a couple of years back. A trend in vertically oriented job reductions? 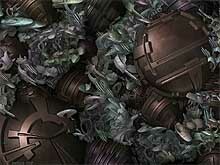 And speaking of the old Amiga days, here’s one of a series of beautiful abstractions by Keith Doyle. Keith wrote one of the most useful applications I used on the Amiga (“the Director” – a few years before Macromedia fastened on that name). The Director was a version of the BASIC programming language which included powerful extensions for displaying and manipulating graphics and sound. Keith’s always been interested in both art and music. Here we see what he’s been up to visually. 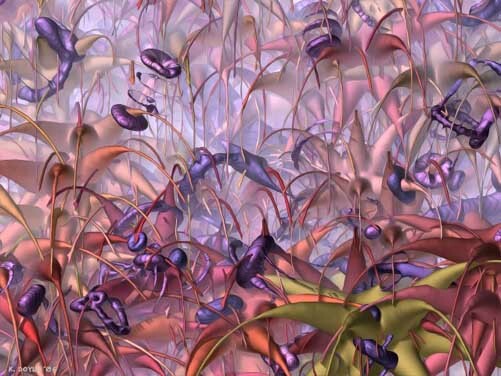 Many of these images use kaleidoscopic reflections, but others are asymmetrical and nearly representational. Although the scenes they seem to represent are places I haven’t visited since the late seventies. Ahem.